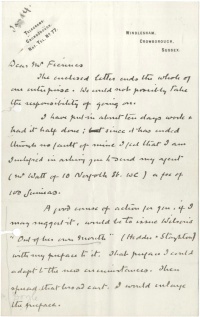 This letter was written by Arthur Conan Doyle from Windlesham, Crowborough, Sussex, to Mr. Fiennes on 14 january [1917~1920] about his preface of H. W. Wilson's Convicted Out of Her Own Mouth: The Record of German Crimes which was published in 1917 by Hodder & Stoughton. The enclosed letter ends the whole of our enterprise. We could not possibly take the responsibility of going on. I have put in about ten days work & had it half done; but since it has ended though no fault of mine I feel that I am justified in asking you to send my spent (Mr. Watt of 10 Norfolk St., W.C.) a fee of 100 guineas. A good cause of action for you, if I may suggest it, would be to issue Wilson's "Out of her own mouth" (Hodder & Stoughton) with my preface to it. That preface I could adapt to the new circumstances. Then spread that broadcast. I would enlarge the preface. 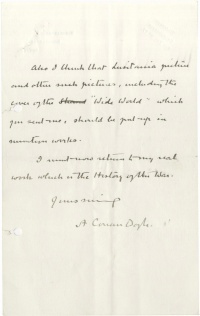 Also I think that Lusitania picture and other such pictures, including the cover of the Strand "Wide World" which you sent me, should be put up in mention works. I must now return to my real work which is The History of the War. This page was last edited on 5 December 2018, at 00:10.